The paintings of Hajime Okuda (1906-1992) evoke the warmth and luminosity of the great French Impressionists while capturing the beloved memories of mid-century Hawai'i. Reminiscent of Monet’s brushwork, Renoir’s vibrant colors, and Van Gogh’s expressive composition, Okuda’s work places him at the forefront of Hawaii’s paletteknife painters of the second half of the 20th century. Demonstrating sophisticated technique, Okuda applied jewel-colored highlights on rich earth tones to build memorable landscapes filled with power and depth. Another remarkable trait of Okuda’s oeuvre is his range: scenes of historic Honolulu, dramatic vistas of Windward Oahu, views of snow-capped Mauna Kea from Hilo Bay, the activity of the waterfront, and glowing seascapes from Wailuku to Lahaina. Okuda’s vision of becoming an artist began when he was a boy in Japan. Born in Kumamoto, Japan, he was six months old when his parents moved to Hawai’i and left him to be raised by his widowed grandmother. In first grade, Okuda’s talent as an artist became apparent; he earned A+ on his artworks and sketched and painted every chance that he had. Okuda sent samples to his parents in Hawai’i and asked them to send him money for art supplies. 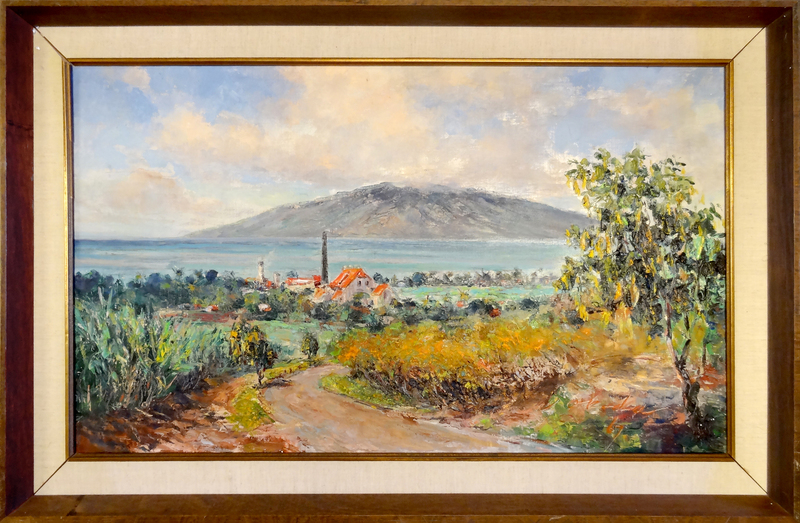 He dreamed of going to America to become an artist, and at age 16, he set out to fulfill his dream when he joined his parents on Maui. 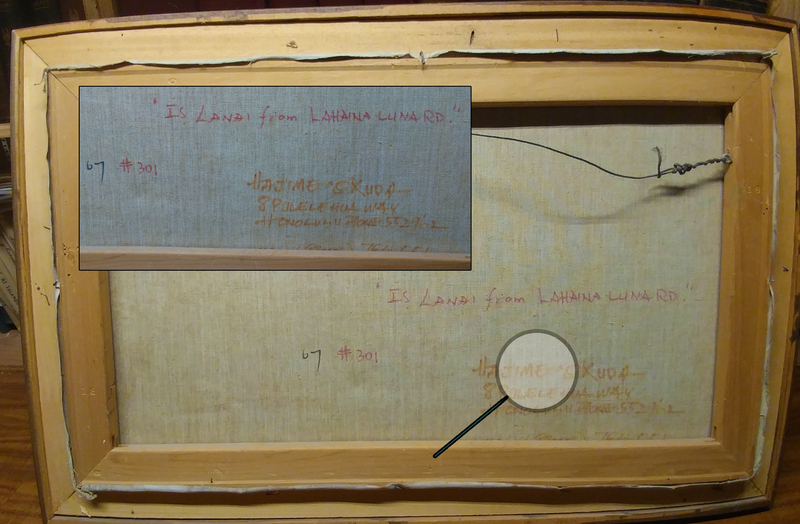 Initially, he had to work instead of attend school—in particular, art school—and held jobs at Hawai’i Times and Hawai’i Hochi as a “printer’s devil” or apprentice. Later Okuda became an inter-island traveling narrator of silent Japanese films and entertained listeners of radio station KMVI by reading stories such as Les Miserables. During World War II, these Japanese programs ceased to beaired so Okuda went to work at the HC&S Puunene Mill, asubject for a later painting commissioned by Alexander andBaldwin in commemoration of its 1900 incorporation. For the tourist industry, he designed Hawaiian floral block-printpatterns that became profitable enough for him to start theH. Okuda Grocery Store in Wailuku. The Okuda Store became not only a highly successful business but also a local landmark. When Hajime was widowed with two daughters, his love for both family and art grew when he married Oshino Tempo, awidow and artist with two daughters. With the support of hisgrowing family, Hajime established the successful MauiSupermarket in 1950 and kept his dream to become an artist.Each week Hajime painted his sale items on the windows ofthe market in water paint, then washed them off with a hose.His first major permanent works were 30’ x 6’ wall murals ofan underwater scene and the Maui landscape. In 1958 Okuda decided to become a full-time artist. With theencouragement of Oshino, he sold the store, and moved toHonolulu to study at the University of Hawai’i and theHonolulu Academy of Arts. 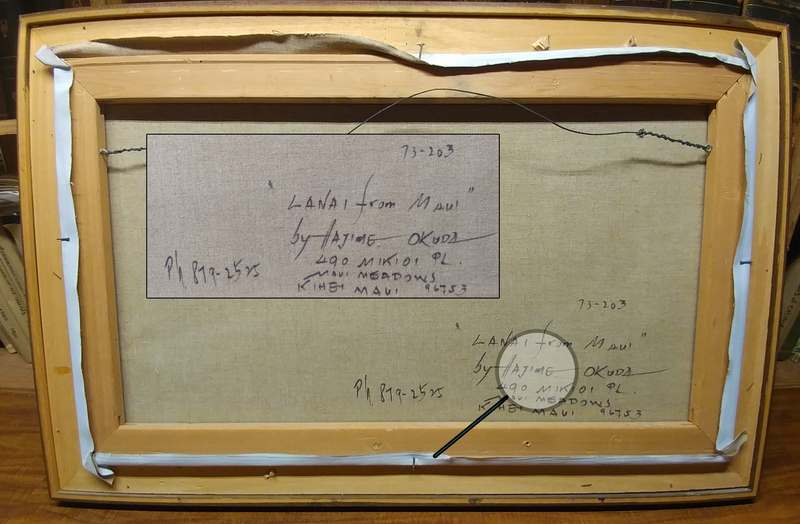 Under the tutelage of artists JohnYoung, Wilson Stamper, and Peter Hayward, Okuda becamea successful member of the first generation of palette-knifepainters in Hawai’i. “You could say that life began for me in1962,” he said when he won first prize for his painting OldHouse in the Association of Honolulu Artists show.Okuda wonnumerous awards, held seven one-man shows, and exhibitedin major galleries both in Honolulu and on the mainland. 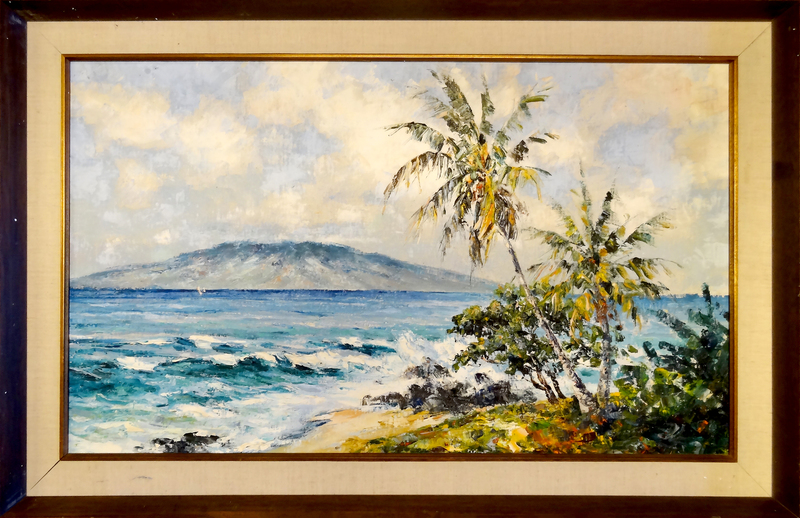 Hiswork has been acquired by many private collectors andbusinesses and displayed at the Mauna Kea Beach Hotel,Hotel Hana Ranch, Whalers Village Gallery in Lahaina,Honolulu Pacific Gallery, and the Robert Hall gallery at theIlikai Hotel. Okuda’s works are increasingly sought-after bymajor local collectors.